Stenella longirostris have many developments that will aid in adapting to a marine lifestyle. The physical characteristics of these mammals allow them to swim extremely fast, communicate with one another, feed, and perform many other daily functions. Spinner dolphins can hold their breath for up to eight minutes and have many specialized physical characteristics that allow them to jump, leap, and spin, such as a narrow ribcage and elongated, slender bodies. Each different species of dolphins has a unique color patter; Spinner dolphins are usually dark on top and lighter on the bottom in order to be further camouflaged from predators. In order to protect itself from predation, these dolphins only sleep with only part of their brain, so that a certain portion of it is still alert. Another important adaptation these animals have to life in the ocean is night feeding. 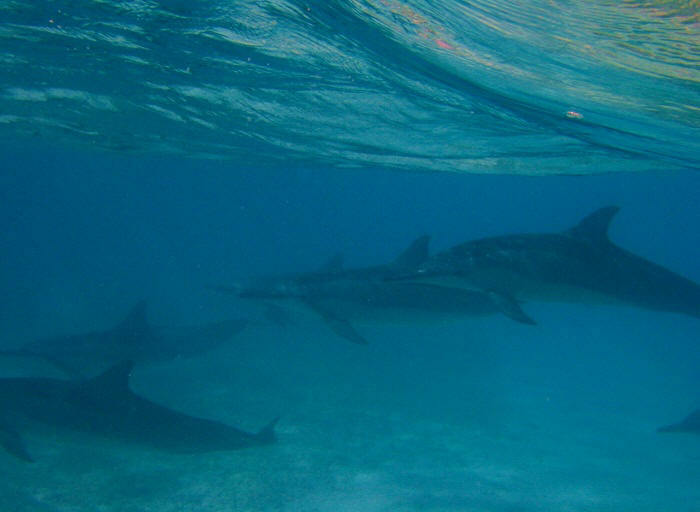 Spinner dolphins feed in groups at night by using various forms of communication. Echolocation, the mixture of clicks and other sounds dolphins use to talk, is extremely important as this time of night when visibility is not sufficient. Dolphins have very advanced hearing in order to listen and comprehend what each individual sound means. It is hypothesized that each dolphin has its very own sound so that every other individual recognizes it. Since dolphins do not have very adequate olfactory senses, it is necessary to communicate with great skill and understanding throughout the entire pod. When these mammals feed at night, they go in large groups and surround the prey and slowly force them near the surface; this is where they attack. This strategy has proved very efficient to provide enough food for each member of the family. Physically, the dolphin’s teeth are a very important characteristic to adapting to life in the. There are between 45-65 sharp and pointed teeth on each side of the upper and lower jaws; this helps to tear food into smaller pieces.